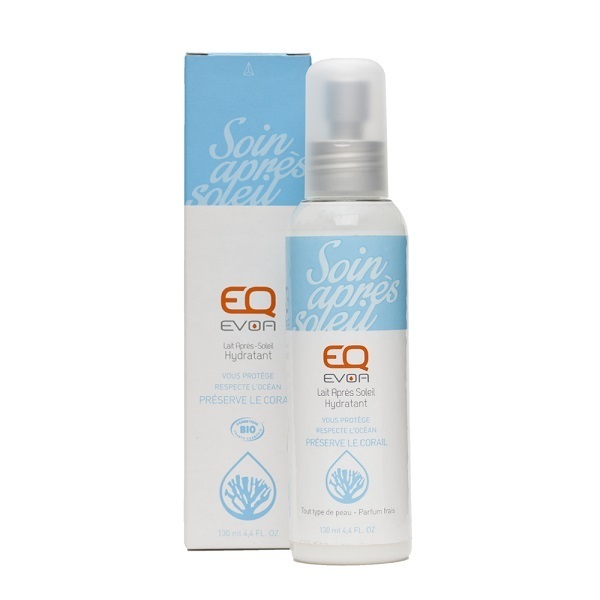 This EVOA After-sun Milk from EQ was designed for damaged skins, dehydrated due to sun exposure. Certified by the demanding label Nature & Progress, soothes quickly and deeply hydrates the skin while providing a fresh feeling. 200ml. Ingredients: aqua, apis vinegria, cety alcohol, helianthus annuus seed oil, chamomilla recutita flower extract, carthamus tinctorius, see oil,geraniol, cymbopogon martinii oil , crataegus, monogyna leef extract, citral, stearyl alcohol, linalool. - Apply a sunscreen before sun exposure. - Re-apply frequently to maintain protection, especially after perspiring, swimming or toweling. - Do not expose yourself to the sun too long, even after applying a sun protection. - Do not expose babies and young children to direct sunlight. A study in 2008 found that suncream causes coral bleaching by promoting viral infections, even at low concentrations. This is because of certain ingredients used to make suncream. EQ tests its products according to a scientific protocol, meaning that they are eco-friendly and approved for use in areas with coral reefs. EQ has developed a complete range of suncream for the whole family, named Evoa, that is 100% natural and certified organic.